His hands reach for the running water; fall short; strain to inch forward. I nudge his elbow, easing his sleeves across the sink counter, wrists dangling over the wide basin; until his fingers find play under the faucet. Here the soap is delivered into the pocket of his two palms; a spicy lather brews, loosening the remains of the day. Drenching, warm, timeless, slow: this moment fills. I am waiting for Mohammed in the winding streets of Fez to make his long, deliberate ablutions before each meal: water and prayer as one. I am standing beside a six year old in the Atlanta airport who stretches tip-toe toward the lavatory stream, singing. I am touching moistened fingers to a baby’s head while the baptismal rite gurgles from my mouth; kissing my husband’s chlorine-pickled flesh, still damp from his morning swim. I am ten, standing beside my father in church, belting out, Come Thou Fount of Every blessing . . . I am splashing in the sink with my father’s hands. His fingers do not bend of their own mind anymore. They don’t recognize the pen or remember how to cradle it. They balk at the toothpaste cap, the fork, the elusive piece of paper. They are retiring from the business of snapping, curling, clipping, rubbing, buttoning, squeezing, holding on. They are innocent again, just being. I find it a moment’s joy to hold them under the river of light. Water and prayer as one. My father nods. I turn off the faucet and take his soft hands in a fresh towel, flossing between fingers. The neighbor has newly manicured his rounded nails; I admire her gift of tenderness. Then the moment is over. There are teeth to be brushed, a bed to be negotiated, rituals of the night. 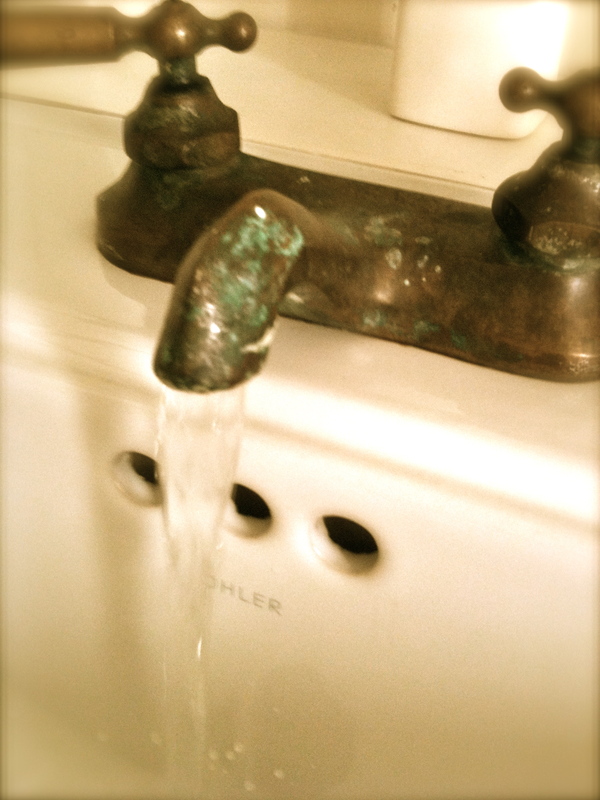 But now and then, as I flick my fingers under a faucet, I remember those hands cupped beneath waterfall. Streams of mercy, never ceasing, call for songs of loudest praise. And so, I lather and splash; remembering, I sing. ~ by Susan on 12/01/2010. This is most beautiful Susan. Your weave of poetry, the sacred and the everyday is stunning.